Infant Swimming Resource’s Self-Rescue™ survival swimming program is a 4-6 week course, scheduled 5 days per week, Monday through Friday, for 10 minutes each day. Children may begin lessons at 6 months of age until 6 years of age. Lessons for a 6-12 month old focus on teaching children to roll onto their back to float, rest and breathe, and to be able to maintain this life-saving position until help arrives. Lessons for children 1-6 years old learn hold their breath under water, swim with their head down and eyes open, roll onto their back to float, rest and breathe, and roll back over to resume swimming until they reach the side of the pool and can crawl out or until they can be rescued. Once the children are fully skilled they will practice ISR’s survival techniques fully clothed during lessons. It is recommended that children complete refresher lessons to help their in-water skill level grow with their physical development. Refresher lessons are extremely important in continuing and maintaining your child’s ISR Self-Rescue development. Children grow and develop rapidly from infants to toddlers and young children. This development process represents improved strength, coordination, and a more finely tuned cognitive ability. In accordance with this growth, children enrolled in ISR return periodically to participate in Refresher Lessons. Refresher lessons are designed to fine-tune your child’s existing Self-Rescue skills to meet the demands of their growing bodies. It will allow them to make adjustments in their float and strengthen their swim. 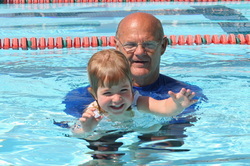 Previous Swim-Float-Swim students will take approximately 2 weeks to complete refresher lessons. 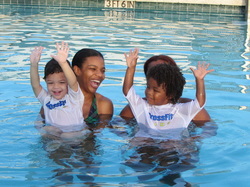 Previous Rollback-to-Float students will take approximately 3-4 weeks to complete refresher lessons. Maintenance lessons are also available at any time for regular fine-tuning of your child's skills. ISR highly recommended maintenance lessons.